(CNN) -- The captain of China's football team, Zheng Zhi, has signed a two-year contract with Celtic, Chinese state media has reported. Zheng's all-action style was a favorite with fans during his spell at Charlton. The 29-year-old utility player was a free agent after being released by English club Charlton Athletic, meaning the move did not have to be completed within the close season transfer window. "Celtic are a great club with a great manager. I'm so excited to be here and looking forward to playing with Celtic. I'm very happy," Zheng told Scotland's Daily Record newspaper. Zheng needs to obtain a work permit before he can be officially cleared to play for his new club in the Scottish Premier League, but manager Tony Mowbray said he was delighted to have landed a major target. "Zheng Zhi is a player I have tracked for some time," he told reporters. "He is a highly-regarded player and was a thorn in our side when he played against us at West Bromwich Albion. "I am delighted that he may join us. He will significantly add to the squad with his quality and the fact that he can play in a number of positions." 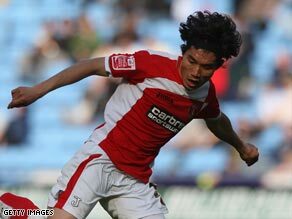 Zheng joined Charlton in December 2006 from Shandong Luneng, scoring nine goals in 63 games for the Addicks, who are now in the third flight of English football. He has been linked with a number of English Premier League clubs, but has opted for Celtic, who are desperate to win back the Scottish title from arch-rivals Rangers. Zheng will further boost Celtic's Asian contingent after last week's signing of promising young Korean Ki Sung-yong. He has made 48 appearances for China, scoring 12 goals. But UEFA confirmed that he will be ineligible for the group stages of the Europa Cup, having missed the signing deadline of midnight on Tuesday.